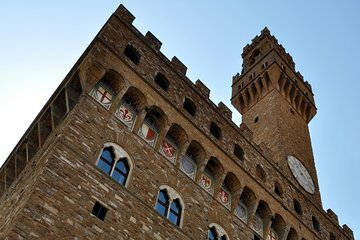 Få kendskab til Palazzo Vecchio, centrum af Firenzes borgerlige magt, under denne guidede tur med oversprøjtning. Lyt som din kunsthistoriker guide bringe historien til liv gennem deres kommentarer mens du udforsker Salone dei Cinquecento, Palazzo tårnet og udgravningerne bliver udført under bygningen. Få panoramaudsigt over Firenze fra toppen af battlements med din lille gruppe, begrænset til 12 personer eller færre for at sikre personlig opmærksomhed. Gør din vej til Palazzo Vecchio for at møde din guide og lille gruppe. Spring over linjen for hurtig adgang til attraktionen uden at vente. Indtast fæstningen, en renæssancetidskapsel fra det 13. århundrede, og lyt til din guides indsigtige kommentar om bygningens historie og kultur. Se på de udgravninger, der udføres under den nuværende bygningens fundamenter, hvor de resterende fundamenter af det romerske teater Florentia afdækkes. Klatre til første sal i Palazzo, hjem til Salone dei Cinquecento. Beundre det 16. århundrede fresker, der dekorere væggene, Dantes skrivebordsmask og nogle bemærkelsesværdige værker i marmor. Klatre Palazzo Vecchio tårn, stående på 312 fod (95 meter). Denne tur giver dig adgang til tårnets øverste slør, et af fokalerne i Firenzes skyline. Få en fantastisk udsigt og foto ops over byen som det sidste stop på din tur. The guide was very well intentioned, knowledgeable and sweet but conditions were not favorable. It was afternoon and there were way too many groups and lots of boisterous kids. The ear sets were AWFUL; all I could hear was her breath. She asked a lot of rhetorical questions which was tricky since we really wanted to just see and hear about art. Accoustics were worst distraction! Too bad! A must to see when in Florence!The guided tour stated "skip the line ticket and avoid ques" this is factually incorrect as we had to wait 45 minutes to enter the tower.Very interesting tour and fantastic building and contents with a wow factor! Our guide Marzia introduced the tour group by name and was both knowledgable and attentive. She picked out the important artifacts and fully explained their significance and context within the other artifacts also providing information from her phone and tablet and asked key questions to engage the tour group. She also took care of us as there are a lot of steps. If you decide to go here make sure you bring water, there is no air conditioning and a lot of people may be packed in as well. Be ready to climb stairs. Other then that the description is spot on for this tour. Well worth the time to be able to enjoy the history with this tour. Due to it being off season and a rainy day we were fortunate to have the tour all to ourselves. Our guide, Antonio, was very knowledgeable and friendly. We are very familiar with Florence history and the Medici but he was able to provide so much information that we had not known. It was a very interesting tour. I would highly recommend this tour. This is a must see in Florence. The property was amazing. A lot of history to see. The tour guide was knowledgeable thorough. We had Benedetta as our tour guide from Italy Segway Tours, even though this was no Segway tour. Benedetta is the best, she is a local and a born tour guide! We thoroughly enjoyed her extensive knowledge and passionate story telling. Highly recommended! Thanks so much for this wonderful experience! This was an amazing tour! The guide was wonderful and knowledgeable. Not only were we given information about the Palazzo Vecchio, but also the history of Florence. I did this tour my first day in Florence, and would not have done it any other way.